Pauline Padgham Shockley was the eldest of nine children born to Sunnyside pioneers Herbert and Gertrude Padgham. 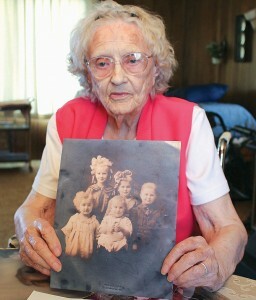 Here, she holds a photograph of herself with four of her siblings. She is the tall girl in the back with the blonde curls and big white bow. A longtime member of the Grace Brethren Church, Sunnyside, Wash. (Nathan Zakahi, pastor), is featured in the Sunnyside, Wash., Daily Sun News. Pauline Padgham Shockley is getting ready to celebrate her 100th birthday. Below is a portion of the story. Click here for the complete article. 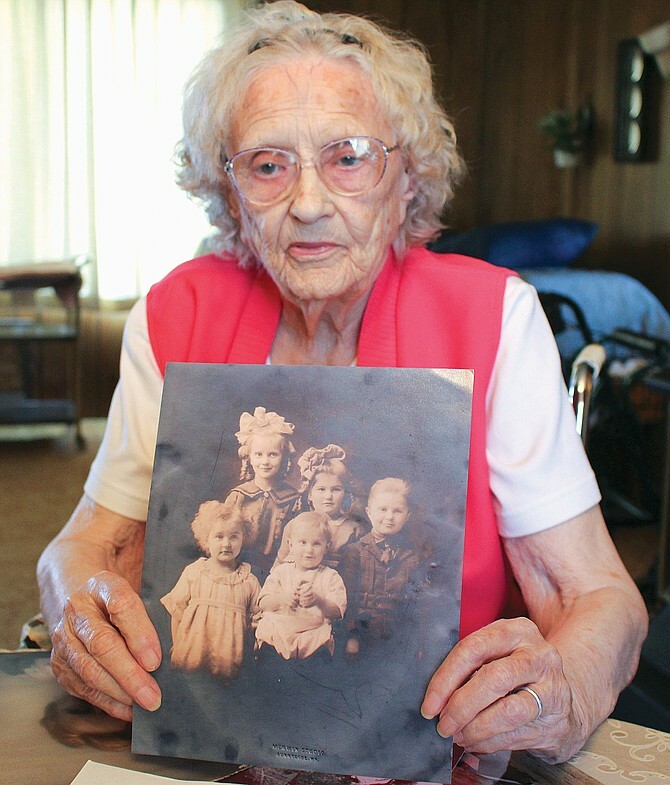 On July 5, Pauline Padgham Shockley of Outlook will celebrate her 100th birthday, surrounded by her family and friends. The centenarian’s party, to be held at Sunnyside’s Snipes Mountain Brewery and Restaurant, is sure to be a fun time. “I know I’m looking forward to it,” she said. “I’ve been thinking about my 100th birthday for several years,” she grinned. For her granddaughters, Barbara Quinlan, Gail Sauve and Colleen Boyer, the opportunity to plan their family matriarch’s birthday gala has been both a labor of love and walk through their family’s history. The women describe their grandmother as a role model to the family, “…and she’s fun,” they agreed. “Grandmother has always been one to be interested in our family history. She has done a lot of her own research into our heritage,” said Quinlan, who along with Sauve live nearby in West Wenatchee. Boyer lives in Dallas, Texas. “It’s been fun to go through her volumes of photographs and hear all of her stories about growing up in Sunnyside,” Quinlan added. For Mrs. Shockley, gathering the threads of family history has been a life-long project and she had made the search of the Padgham family heritage easier for her family by compiling the genealogy in a typewritten sheaf of pages.